Solar Obstruction Lights Green solar LED light provides in excess of 3.6km visible range, & is suitable for a variety of applications including general hazard, barricade & low-intensity obstruction lighting. Solar Obstruction Lights Red solar LED light provides in excess of 3.6km visible range, & is suitable for a variety of applications including general hazard, barricade & low-intensity obstruction lighting. Solar Obstruction Lights White solar LED light provides in excess of 3.6km visible range, & is suitable for a variety of applications including general hazard, barricade & low-intensity obstruction lighting. Solar Powered Taxiways and Runways Yellow solar LED light provides in excess of 3.6km visible range, & is suitable for a variety of applications including general hazard, barricade & low-intensity obstruction lighting. Solar powered Taxiway Blue edge lights, Taxi-way solar powered Airfield light. Blue Taxiway. Solar Airfield Light - Blue Taxiway, High OutPut LEDs. Solar Airfield Light and Solar Powered Airfield lights. High OutPut LEDs. Taxi-way solar powered Airfield light. Blue Taxiway. Solar Airfield Light - Blue Taxiway, High OutPut LEDs. Solar-Powered Helipad Light - Green LED solar powered Airfield light. Green Airfield. High OutPut LEDs. Solar Powered Infrared Military Airfield Lights, Obstruction For defense applications the unit is available in infrared (IR). Solar Powered Runway End Threshold LED Solar Powered Threshold LED lights Red/Green. High OutPut LEDs. Runway Airfield light Solar Powered. White Airstrip. Runway Solar Airfield Light - White, High OutPut LEDs. Solar Helipad Light - Yellow solar powered Airfield light. Yellow Caution. Solar Helipad Light - Yellow Runway / Obstruction / Helipad. High OutPut LEDS. Airfield Solar Powered LED lights, solar LED light provides in excess of 3.6km visible range, & is suitable for a variety of applications including general hazard, barricade & low-intensity obstruction lighting. Solar Aviation Warning Light for Communications Tower obstacles, Telecommunication Obstruction Light, Cranes Obstruction Light, chimney Obstruction Light, Buildings Obstruction Light, Sport Stadiums Obstruction Light, High Voltage Towers Obstruction Light, Obstruction Light, Wind Generation Obstruction Light, Hazardous obstructions to air traffic. Infrared Solar Airfield Light 20 Ultra-Hight intensity IR LEDs. Infrared for Military defence applications. Solar Airport Caution Light 20 Ultra-Hight intensity LEDs. Yellow. 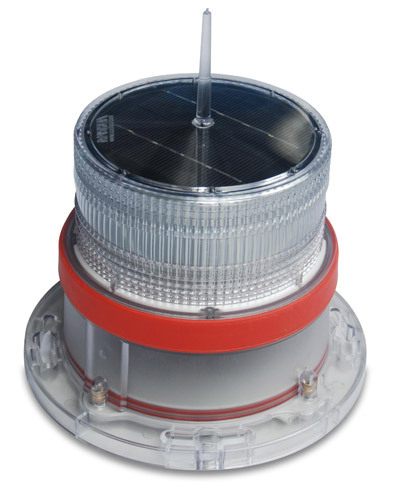 Solar Runway Edge Light Blue is ICAO Approved for use in aerodromes with either extraneous lighting (50cd), or without extraneous lighting (25cd). 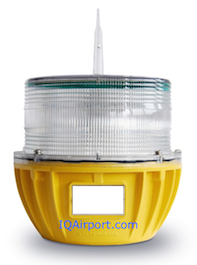 Solar Runway Edge Light Green is ICAO Approved for use in aerodromes with either extraneous lighting (50cd), or without extraneous lighting (25cd). Solar Runway Edge Light Infrared is ICAO Approved for use in aerodromes with either extraneous lighting (50cd), or without extraneous lighting (25cd). 103910 Solar Runway Edge Light is ICAO Approved for use in aerodromes with either extraneous lighting (50cd), or without extraneous lighting (25cd). 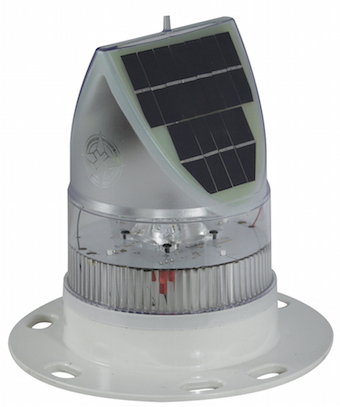 Solar Runway Edge Light White is ICAO Approved for use in aerodromes with either extraneous lighting (50cd), or without extraneous lighting (25cd). 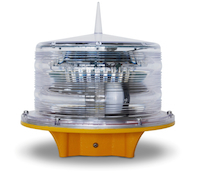 Solar Runway Edge Light Yellow is ICAO Approved for use in aerodromes with either extraneous lighting (50cd), or without extraneous lighting (25cd). Solar-Powered Ultrasonic Anemometer with GSM. The ultrasonic anemometer is corrosion-free, and utilises all-weather sensing technology – making the unit ideal for land-based and marine environments. Solar LED Airfield Lighting Solar Barricade Light. L-807 Wind Cone INTERNALLY LIT L807 - 120-230VAC FAA L807 Non-frangible wind cone designed to meet FAA L807 requirements. L-810 Obstruction Light. Solar L-807 Wind Cone INTERNALLY LIT L807 - Solar Powered FAA L807 Non-frangible wind cone designed to meet FAA L807 requirements. L-810 Obstruction Light. 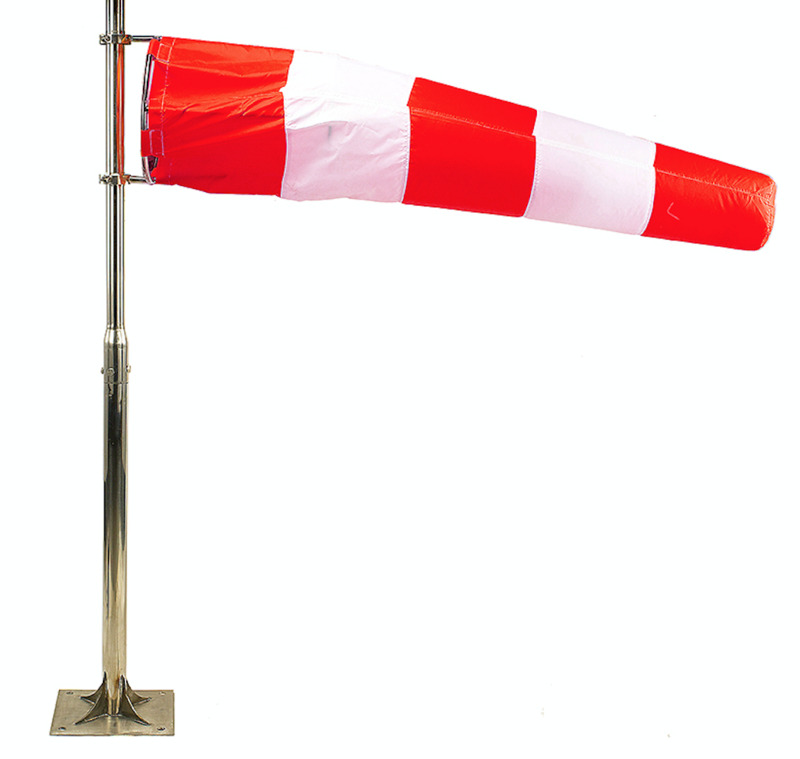 Infrared Solar L-807 Wind Cone INTERNALLY LIT IR Infrared L807 - Solar Powered FAA L807 Non-frangible wind cone designed to meet FAA L807 requirements. L-810 Obstruction Light. MIL-IR Military Grade Infrared. 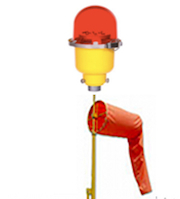 L-806 Wind Cone INTERNALLY LIT - L806 120-230VAC FAA L806 Frangible wind cone with 8-foot wind sock designed to meet FAA L806 requirements. L-810 Obstruction Light. L806 Solar Wind Cone INTERNALLY LIT L806 Frangible wind cone with 8-foot wind sock designed to meet FAA L806 requirements. L-810 Obstruction Light. Infrared L806 Solar Wind Cone INTERNALLY LIT IR Infrared L806 Frangible wind cone with 8-foot wind sock designed to meet FAA L806 requirements. L-810 Obstruction Light MIL-IR Military Grade Infrared. Solar Obstruction Light completely self-contained LED lights are designed to suit a range of aviation and general applications including Obstruction, emergency airstrip, caution, taxiway, and threshold lighting.